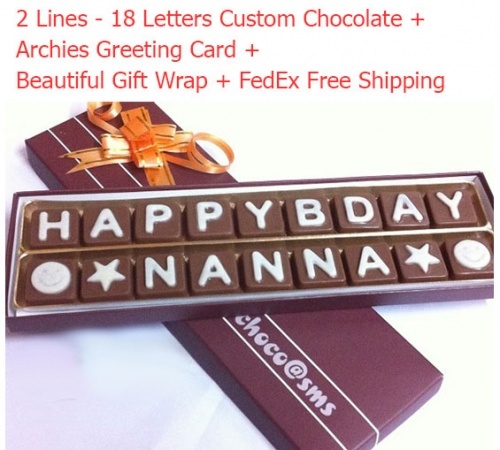 Custom chocolate, two lines with 18 letters max limit. 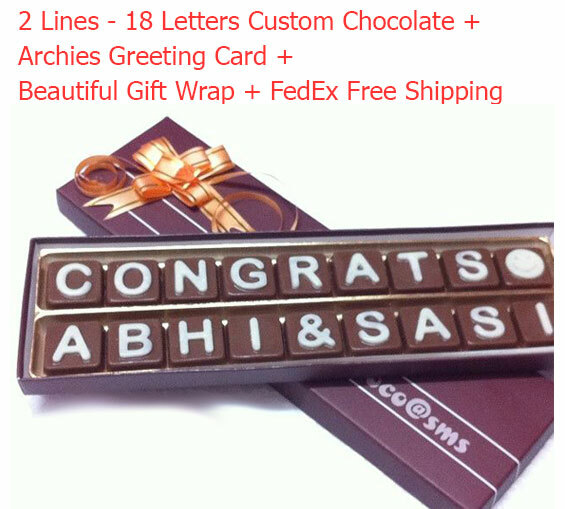 Like how we have 1 line and 3 lines, this is 2 lines and 18 characters custom chocolate, it is ideal for Birthday gifting, congratulating, showing your love, affection, and gratitude to your friends, family, and colleagues. Please choose your words so that it fits into the 18 letters. How to provide the custom message: Please enter your 18 letters at ""Custom Message"" option at below. 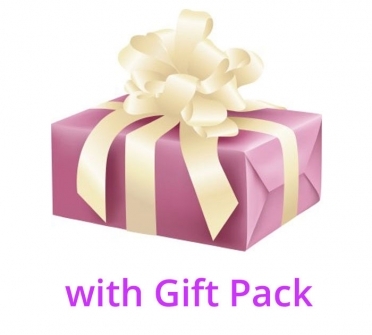 What you will get in this pack: 18 letters of greeting on chocolate + Some Free Chocolates + Birthday Greeting Card by Archies + Gift Wrap + FedEx Quick Shipping. Chocolate Base: We make this chocolate in 2 variants one is Milk and another is Dark, please choose your choice from below options. Note: If you want any other theme greeting card please mention in the Custom message option. Every chocolate is handpicked, packed nicely and have lifespan up to 100 days. Every Chocolate is unique of its taste and is 100% natural and vegetarian.